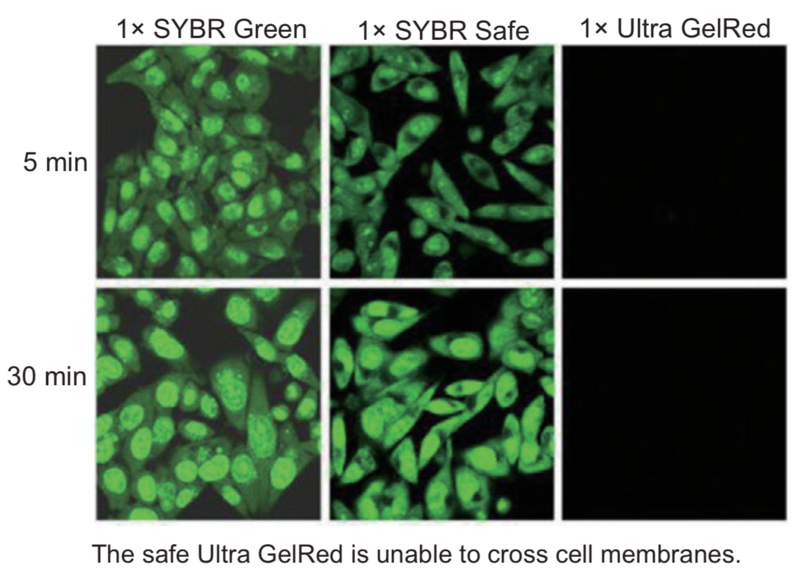 Ultra GelRed Nucleic Acid Stain (10000X) (Vazyme, #GR501) is a novel fluorescent dye for nucleic acid gel staining with high sensitivity, low toxicity, and robust thermal stability, which makes it a perfect substitute for ethidium bromide (EB). For DNA detection through agarose gel electrophoresis, Ultra GelRed shows a higher sensitivity for low concentrations and trace DNA, especially small molecular DNA. Under the ultraviolet light, the DNA exhibits red fluorescence. Ultra GelRed can be used for dsDNA, ssDNA, and RNA staining in agarose and polyacrylamide electrophoresis. Non-toxic: Ultra GelRed has macromolecular characteristics so that it cannot penetrate cell membranes into the cells. High sensitivity: suitable for electrophoresis staining of various sizes and is highly sensitive for low concentrations and trace DNA. High stability: suitable for the agarose gel prepared by microwave or other heating methods. High SNR: strong sample fluorescence signal and low background signal. Wide range of application: Suitable for various staining methods, including staining before electrophoresis (gel staining) or post electrophoresis (soaking staining). Applicable to agarose gel and polyacrylamide gel electrophoresis. Suitable for dsDNA, ssDNA, and RNA staining. All components should be Store at room temperature. Click the button below to add the Ultra GelRed (10,000x) fluorescent dye | GR501 to your wish list.